On Earth the force that drives winds is heat from the Sun. On Mars the same logic holds true. But the two planets have atmospheres that differ greatly. The Martian atmosphere is about 95% carbon dioxide, 3% nitrogen, 1.6% argon, and has traces of oxygen, carbon monoxide, water, methane, and other gases, along with a lot of dust. Earth's atmosphere is 78% nitrogen, 21% oxygen, 1.0% argon, 0.04% carbon dioxide, and small amounts of other gases. It also averages about 1% water vapor. Scientists have begun to study the weather and circulation of winds on Mars, but much remains to be discovered. Overall, global patterns appear simpler and more repeatable than what happens on Earth. But the apparent simplicity may be due mostly to scientific ignorance coming from a lack of data, especially at smaller scales such as a few kilometers or miles in size. A great deal of research remains to be done to fully understand the global patterns on Mars. Besides differences in atmospheric composition, Earth and Mars also differ in surface materials. For example, Earth's surface is largely ocean, which provides a ready source of heat and water vapor for the air. Open water is completely lacking on Mars, and the atmosphere has only traces of water vapor. As water on Earth cycles through its various forms — oceans, lakes, clouds, vapor, rain, snow, ice — it carries a lot of energy through the atmosphere. Thus we can experience large and devastating storms. Yet having only a trace of water vapor, the Martian atmosphere carries much less energy and is far less dynamic than Earth's. What Mars does have is a lot of rock. 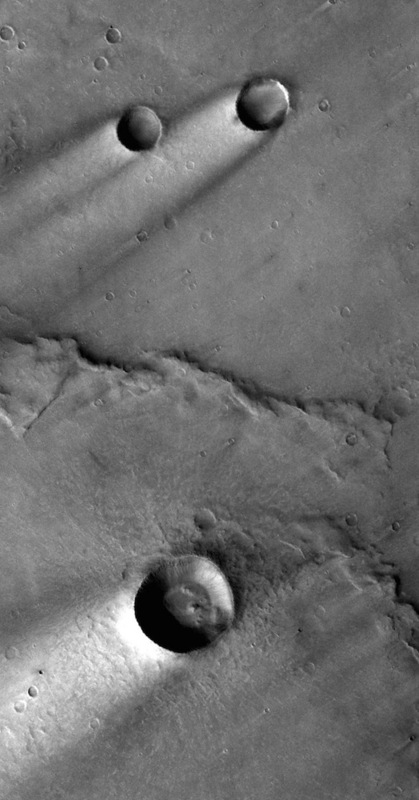 Lava flows, for example, cover many parts of Mars. Yet relatively few places show a bare hard-rock surface. Instead, dust, sand, and fine-grain sediments cover much of Mars. Under a largely cloudless sky, these sediments heat up by day and cool off quickly at night. As scientists say, they have low thermal inertia, meaning they change temperature easily. If you have ever walked barefoot on sand that was hot at noon yet cool after dark, you have personally experienced low thermal-inertia sediment. On a terrestrial beach, the sand's difference in daily temperature may range 25° Celsius (45° Fahrenheit). On Mars, however, the daily temperature range near the equator can reach 100° C or 180° F.
Air rises when heated by hot ground, and the motion pulls in cooler air at ground level. Sometimes this creates a dust devil when fine particles of dust are swept up by the cooler air moving across the ground. 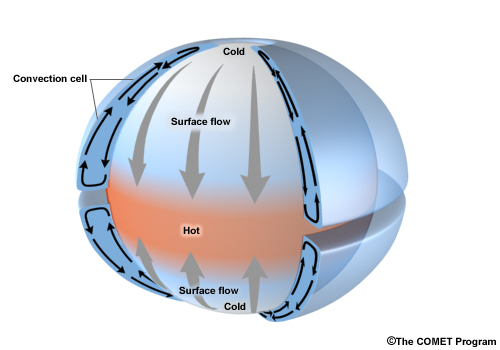 More generally, temperature differences between one area and another cause air to flow between them, producing winds. 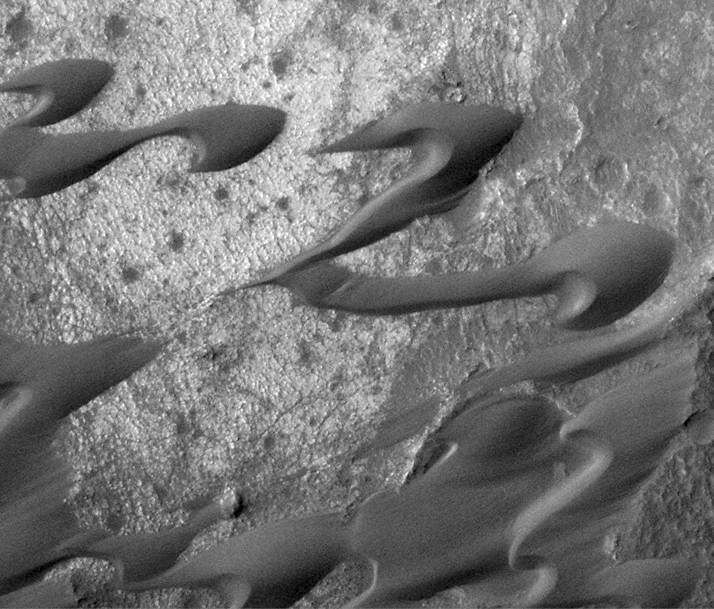 Scientists have made only a few direct measurements of Martian wind speeds. The Curiosity rover is making such measurements on Mars now. But studies of dust storms, cloud movements, and wind streaks suggest that winds can blow up to 100 kilometers per hour (62 mph). Despite the thin atmosphere — roughly 1% of sea level pressure on Earth — that's more than enough to move sand and fine particles of rock. However to a human standing on the surface, this would feel more like a light breeze than a tropical storm. Driven by the wind, small particles skip, hop, bounce, and slide across the surface, chipping and eroding rocks as they go, in a process called saltation. In large quantities, loose particles form dunes. But Mars is a spinning planet, and this complicates wind patterns. At low latitudes, Hadley cell motion dominates. Named for English scientist George Hadley (1685-1768), who first described it on Earth, the pattern features heated air rising around the equator. One part of the warmed air flows northward (and one part southward) to about 30° latitude, where it cools, sinks, and then flows back toward the equator at the surface. But the air flow back toward the equator at the surface does not go in a simple north and south direction thanks to the planet's rotation. As the air moves toward the equator in both hemispheres, the Coriolis effect deflects it toward the west. For example, in the northern hemisphere, the surface flow moves southward, but is deflected west. The result, if you stood on the surface, is a wind blowing from the northeast. In the southern hemisphere, the northward flow toward the equator is similarly deflected west, so to a person on the ground, the wind blows from the southeast. At higher latitudes, Mars experiences a series of high and low pressure areas. Where these interact with Hadley cell movements, sharp weather fronts and even storms can arise. Martian frontal storms, however, tend to be less violent than terrestrial (Earth) ones because the atmosphere is much thinner, temperatures are lower, and water vapor — which carries a lot of energy — is largely lacking.